There are currently 29,698 users on this website. I would like to ask if anybody here has some experience or knowledge concerning the Ecu de Six livres, struck by the French National Convention during the revolutionary year of 1793. I have two examples in my collection, one struck at Lyon (Atelier D), the other at Lille (Atelier W). 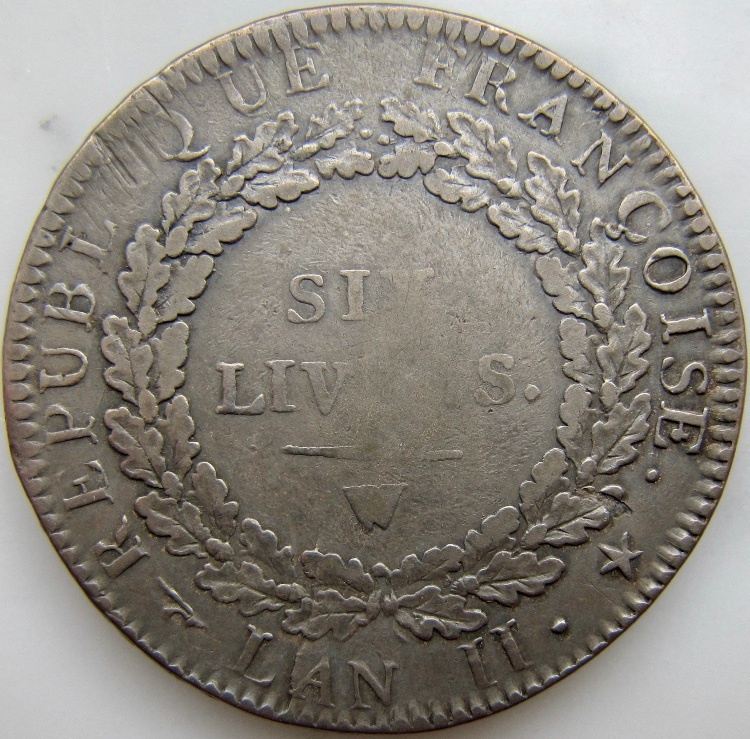 The Lille raises some question for me as it shows some anomalies not seen on other similar coins: first, it displays a die break on reverse which, I think, was the reason for the weak strike which can be seen in places. The other anomaly is the irregular spacing of the date, specially the '9' which is wildly out of line with the rest of the digits in the date. It have observed neither of these anomalies on any of the Ecu de Six Livres from Lille recorded on Acsearch. The coin otherwise conforms well with the nominal specification for the Ecu de Six Livres de la Convention which are for a diameter of 38,5 mm and a nominal weight of 29,23g. The edge of my piece reads, in high relief, 'Dieu Protege La France'. So there you have it: if anybody has some experience on these, strike characteristics, general appearance, etc regarding this issue, I would greatly appreciate it. I can't help, but I love that obverse design. I used to own a small gold coin with this scene, and I can imagine it is quite striking on a large coin. 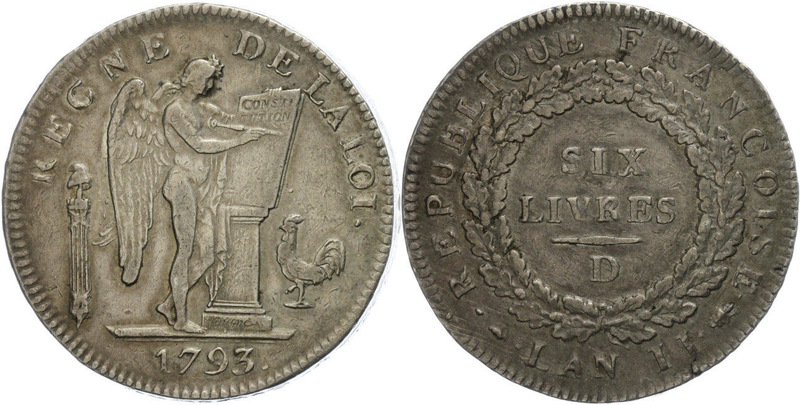 I know there were a higher percentage than normal of anomalies in French coins from those turbulent times. Here's another example from the beginning of the same year demonstrating that not all mints were on the same page with their issues. I, too, would be interesting in learning more about how the revolution affected mint operations beyond the creation of new designs. I imagine there would have been disruptions at the top level of management as well as disruption in the supply chain (quality steel for dies and punches was difficult to produce until the 19th century -- that might lead to using dies and punches longer than usual -- the Lille mintmark in first example of the OP was made with a punch that was almost completely worn down). Thank you for your input, tdziemia and jgenn. being the result of mints operating during very troubled and uncertain times. Thank you. I am aware of that and other sites in France. Unfortunately they do not provide the information I am seeking. 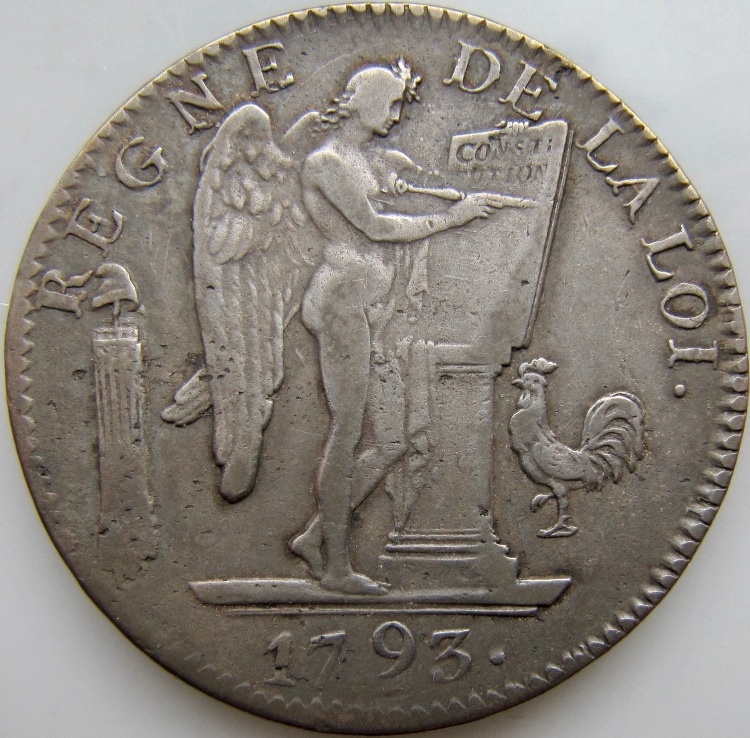 My 1989 Gadoury catalogue doesn't list a variety for 1793W, but the example of this type illustrated (a 1793L coin) has an irregularly-spaced date with the final '3' slightly too far to the right and distinctly lower than the other numerals. Maybe the Lille die sinker was still experiencing "shell shock" and had rather unsteady hands in 1793. Thank you, Numisrob. for I that bit of information. From what you say, improperly aligned numeral in the date seems not to be that anomalous after all. My example from Lille just seems a bit extreme. Thank you very much, tdziemia. I have looked at the examples in acsearch, among them a fair number from Lille and noticed, as you have, that improper numeral alignment is not that uncommon. My example is just more 'extreme', and particularly, I did not see any examples at all with die failures from any of the mints. This one seems to be the only one. The historical background that you mention, namely the siege of Lille in 192 by the Austrian armies probably did have some effect on the work at the Lille mint. In general I am surprised about the apparent general lack of die and manufacturing information concerning the Ecu de 6 Livres de la Convention. These are coins which enjoy a lot of collector popularity and I expected to find more information about them. I imagine that somewhere in the 100+ year history of the Bulletin of the French Society of Numismatics, there is an article on this type. I've never been deeply enough into the field to try and access literature like this (though the more time I spend on CCF, the more likely it becomes). It took 0.72 seconds to rattle this change.